It was a day of celebration and fun at Dairy Beach in Durban last Saturday as twenty two Zulu surfers from the Umthombo project produced some top class surfing in good quality Durban surf in the second Umthombo Surf Contest. Light rain did nothing to dampen the spirits of the surfers, officials and spectators as they got into the spirit of the unique and special surfing contest. At the end of five hours of fun and some serious competition talented Sihle Mbutho took the honours and the spoils. Not only did he win the Pro division final and the gold medal but he also took home the big money prize, which will be held in trust for his surfing needs, as well as a brand new O’Neill wetsuit. Mbutho is a young man of many talents. Not only can he surf like a pro but he has also taken time to complete an International Surfing Association Level 1 Coaching Course through Surfing South Africa’s capacity and skills development programme. 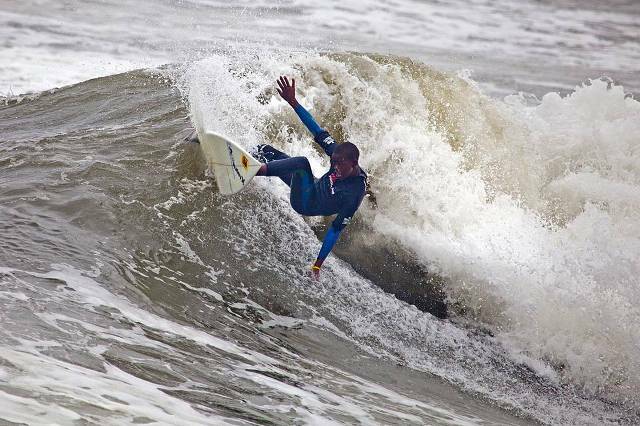 Mbutho uses his coaching skills to teach the up and coming Umthombo surfers the art of riding the waves. Runner up to Mbutho was the incredibly talented 15 year old Nthando Msibi. 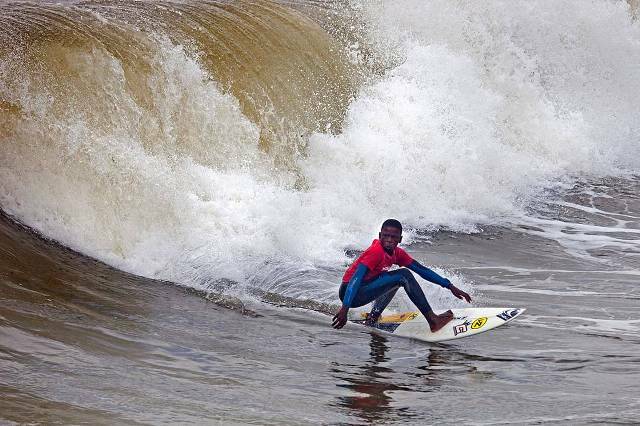 Known as “Biggie smiles” to his surfing mates, Nthando has already represented KZN at the SA Junior Championships and will be competing in the National Junior selection trials in January. Third place went to Sifiso Mhlongo, another Umthombo product who has represented KZN and the SA Development Team on a number of occasions. Newcomer Sandile Mbuthuma finished fourth in the final. The Rookies title went the way of Lungani Cele who beat Mthobisi Shandu into second place. Linda Masuku was third. What made this event so unique is that it was the first surfing competition to be run entirely in isiZulu and what made it special was the fact that all of the competitors former street children who have found surfing to be a form of therapeutic intervention that has seen them turn their bag on the streets and their former way of life. In addition this contest was the first one run entirely by Zulu personell. All the judges, the commentators, the tabulator and other officials who ran the event were isiZulu speaking products of the Surfing South Africa and KZN Central Surfriders Association transformation and development programs. 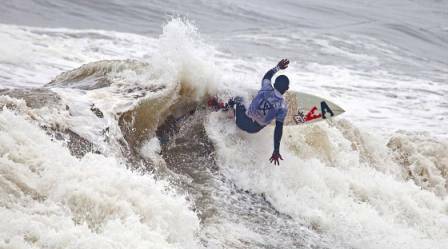 For many of the competitors, such as Sihle, Nthando, Sandile and Sifiso Saturday’s event was a chance to showcase their talent while for others it was an opportunity to compete in a real, well organised surf contest. Thanks to the support that came from a number of benefactors, surfers received a commemorative tee shirt, a medal of participation, a beanie sponsored by DC and R100 in cash in an envelope with their name on it. The winners of the two finals were awarded R2000 each of which R1900 will be held in trust for them by Umthombo and R100 will be given to them to spend on luxuries. The surfers who come second in their respective finals secured R1500 each with R1400 going into their trust funds while third placed finalists won R1000 each with R900 going into their Trust funds. The surfer who come fourth in the Pro Final will put away R400 of the R500 awarded. In addition all the participants received R250 which will be held in trust for them by Umthombo. The money held in trust will be available to each surfer based upon their individual needs and subject to the supervision of Umthombo. This Umthombo Street Children initiative was supported by Mark Snowball, theBOMBsurf, O’Neill Wetsuits, Surfing South Africa, KZN Central Surfriders Association and others. Surfing South Africa is the recognised governing body for the sport and is a member of the South African Sports Confederation and Olympic Committee (SASCOC) and the International Surfing association (ISA).